The Texas Historical Commission is attempting to ensure that occupants of graves sleep eternally. This of course requires research. It’s necessary to locate graves in order to protect them from bulldozers, backhoes and generally innocent people abusing the landscape and what lies beneath. 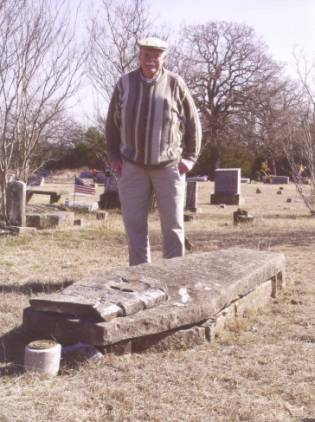 Some graves were long lost to posterity before State of Texas historian Chris Dyer and Hood County genealogist Frank Saffarrans began tracing them through Hood County Genealogical Society records, county and USGS maps, and folklore. In Hood County and bordering acreage, Dyer and Saffarrans visited 42 sites. These included large perpetual care cemeteries and small cemeteries maintained by cemetery associations. Of special interest were isolated tombstones on area ranches and a cemetery overgrown with pesky junipers. Only once were Dyer and Saffarrans unable to survey a known gravesite. Only once did they determine a gravesite did not indeed exist. Cemetery data is worthwhile on its own. There’s a value-added purpose to this data. Preservation. Forever and a day from now, researchers and construction crews will be able to determine the locations and bounds of the sites. They were marked with GPS instrumentation, a global-positioning system, accurate to 12 inches. Dyer and Saffarrans also encouraged each landowner to apply for a Historic Cemetery Medallion. Historic designation tends to discourage bulldozers, too. Most of the statewide counties in the cemetery survey are along the I-35 corridor, Dyer said. That was for a reason. “That’s where most of the major population centers are,” Dyer, a Texas Historical Commission staff historian, said. “We wanted to cover the fastest growing counties, because that’s where the most development is. Where you have the most development, you have the most threatened sites. There’s nothing extraordinary about most of the Texas cemeteries he’s researched with THC colleague Martha Berryman. In Hood County, rural cemeteries were much alike for sociological reasons, he said. Some of the Hood County sites contained as few as one marker. Some of the sites were virtually impossible to explore because of terrain. “I don’t think we found any sites in Hood County that weren’t previously known,” Dyer said. “Mary Kate Durham told us about some she knew existed. That’s perfectly legal, by the way, as long as you tell the authorities where the bodies are buried. “You’re supposed to register a burial site with the state because of health and safety codes and issues,” Dyer said. Registration helps Dyer with research. He can only chart and protect the tiny family plots if he knows about them. Dyer and his tireless compadres can locate the fence with GPA points. “Some counties have gotten readings with recreational GPA equipment,” Dyer said. “Our GPA equipment will get you within inches. There’s a reward of sorts for cooperative landowners, a fighting chance for an official cemetery medallion. “The criteria is pretty strict for Texas historical markers, so in 1997 we developed a program specially for cemeteries,” Dyer said. Graves that can’t be located do not apply, unfortunately. “Frank and I were looking for a grave south of Tolar,” Dyer said. “Somebody had marked the grave on a map. “I spoke to the property owner, and he didn’t know anything about it. The previous owners had never heard of it. Nobody knew, so it was never resolved.